The Topic: How to succeed in a new leadership role … others have covered the subject in some depth and from multiple viewpoints. The Format: String together a flurry of short and pithy advice about how to be a better leader … yes, I have read other books which opt for this format over the more traditional narrative or text style. The Track Record: I know that Pam Fox Rollin hit the Amazon best seller list first time around. I also wondered what she could possibly have done to make a second edition that would meet the expectations for a strong reissue. Pam has not just updated her materials, but made them even more useful than the original version. One reason is the attention to mindsets paid by 42 Rules Other “how-to-do-it” volumes focus on the nuts and bolts of being a leadership, which is certainly important. Pam also talks about the attitudes and perspectives that mark effective leaders. Follow her guide about how to think and visualize like a leader and you will be ahead of the game before you actually do anything else. An additional value of 42 Rules is that the book works for you and with you. If you are a new leader or simply aspire to be in a leadership role in the future, you will find plenty of useful and down-to-earth advice about how to present yourself as a capable leader, regardless of current position or title. Points of view are not something you develop as a leader. You need to have them from day one, as this section affirms. Take the time to write down your strategic impressions of what is in front of you. You have just moved ahead of most people in managerial and leadership roles. If you are already in a leadership position or moving from one level of leadership to another, you will also find much of value here. The strategies Pam offers are timeless and apply nicely whether you are a person leading a very small group for the first time or are a seasoned leader in charge of many and much. This section directly faces one of the most potentially devastating issues for a Leader On The Move. As we grow and gain confidence, a very real possibility exists that our ego will take control. Down that path lies very little that will help you be a more effective manager. 42 Rules helps you combat this by a relentless focus on others with whom you interact. A third compelling use of this book relates to others. The most gifted and effective leaders recognize the value of helping others achieve and grow. You just cannot build effective teams or a viable organization without doing so. 42 Rules provides the groundwork for personal coaching, small group development, and large-scale corporate leadership development. You may want additional information about some specific issue or topic, but you will not find that anything has been overlooked. 42 Rules has it all. I had to include this one. Mistakes are the real crux of leadership effort. Nothing is quite as dangerous or as potentially rewarding as the dynamics around your response to a major mistake, whether your own or someone else’s. How we handle this leadership challenge reveals our seminal nature. Originally published in Spring 2011, Pam Fox Rollin has refreshed and updated her first book. 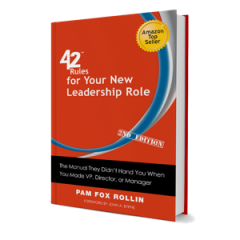 The 2nd edition of 42 Rules for Your New Leadership Role: The Manual They Didn’t Hand You When You Made VP, Director, or Manager is a real gem and easily worth the cost. Rereading my favorite passages and annotating like crazy in the Heartland …. Disclaimer: I received a complimentary copy of 42 Rules For Your New Leaderhsip Role for review. I was under absolutely no obligation to say anything positive about the book. I found it easy to do so and can openly recommend this book to new leaders, seasoned leaders, and leaders who are growing other leaders. If they called today, I would happily buy the book for a lot more than they are asking. This entry was posted in Change, Coaching, Communication, Informal Learning, Leadership, Learning, Reflection, Relationships and tagged Education and Training, Leadership, Management by John E. Smith. Bookmark the permalink.